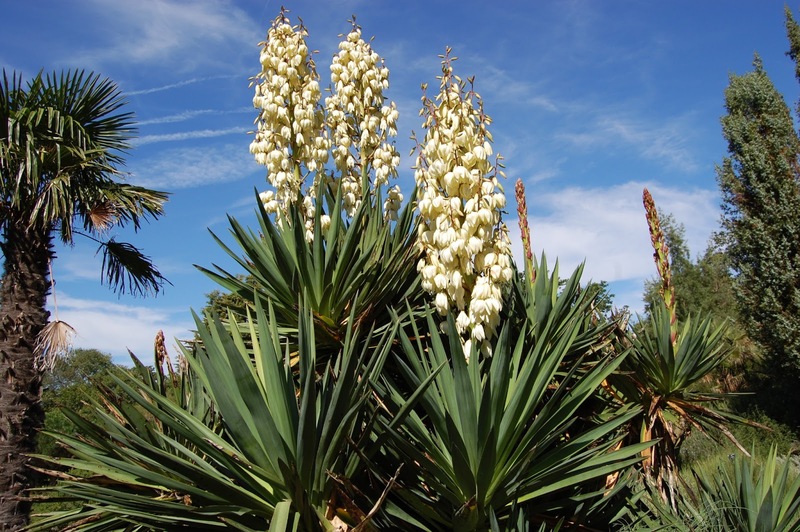 The genus Yucca comprises of approximately 40-50 species of hardy and tender evergreen shrubs and small trees. Native to the arid regions of the Americas and the Caribbean, they are long-lived and thrive in seaside gardens, flowering at their best during hot dry summers. They have a clear architectural habit, with narrow, usually rigid, strap-like leaves. The blooms emerge on tall racemes or panicles. The drooping flowers are bell-shaped, lily-like and help to create a subtropical effect in temperate gardens. The hardy species can be planted outside in April or October in any ordinary, well drained garden soil and preferably in a sheltered position that receives sunlight throughout most of the day. They will fare even in poor, sandy soils. Be aware that they can be killed by excessive watering during their summer dormant phase. Yucca species that are not frost hardy can only be grown outside in warm-temperate, Mediterranean climates or warmer. As a rule they will tolerate a range of conditions, so long as they are grown in full sun, and in a well-drained soil. Tender species can be grown in 6 - 10 inch pots using a good quality compost such as John Innes 'No 2 or 3'. Potting on to larger pots is usually done in spring or early summer. Maintain a minimum overnight temperature of 13-16 degrees Celsius. They can be placed outside in a sunny position once the risk of late frosts have passed. However they will need to be hardened off first and protected from scorching during the hottest times of the year.